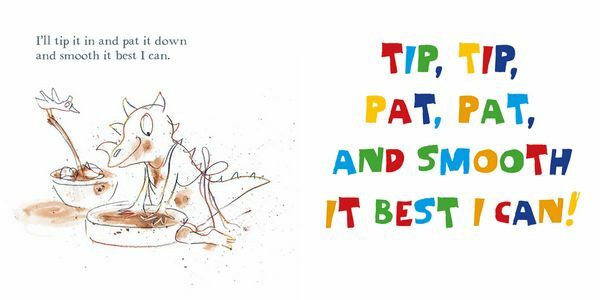 From the award-winning team of Ann James and Janeen Brian comes I'm a Hungry Dinosaur, a gorgeous new rhyming picture book follow-up to I'm a Dirty Dinosaur, who is now all cleaned up (for the moment, anyway) and hungry for cake. I'm a Dirty Dinosaur has been a hit for us in the US - critically acclaimed with a starred review in Kirkus and raves elsewhere - there are 42,000 copies in print. I adore this author. Not only are the books cute and singsongy, but she uses unique materials when illustrating. In this one, she uses flour, chocolate frosting and sprinkles! We enjoyed reading the book, then making our own illustrations in a messy art project using the same ingredients. Janeen Brian is the author of many books including three CBC Notable Books. She lives in Australia. Ann James was a secondary school art teacher before she took up children's book illustration over twenty years ago. She has illustrated more than 50 books since then. Ann lives across the street from the dog beach in Melbourne, Australia, where she spends time thinking and walking with her dogs, Ollie and Kip.